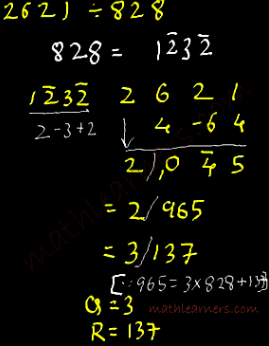 Division using Vedic Mathematics when Nikhilam and Paravartya is not possible to be applied BUT if divisor is either multiplied or divided by some factor then it is possible. As seen earlier in Multiplication, Anurupyena means Proportion. In this topic I will let you know the shortcut to divide numbers using Anurupyena Sutra. But before checking Anurupyena Methos below concepts are required. � As we know the meaning of Anurupyena (as proportion/ratio), we multiply/divide by factor to make divisor closer to larger number (To apply Nikhilam) OR to make closer to smaller number (To apply Paravartya). Later we multiply/divide QUOTIENT with same factor. Its always good to use factors for multiplication instead of division because if division is used then on dividing Quotient by that factor might create non-integer i.e. a decimal quotient. 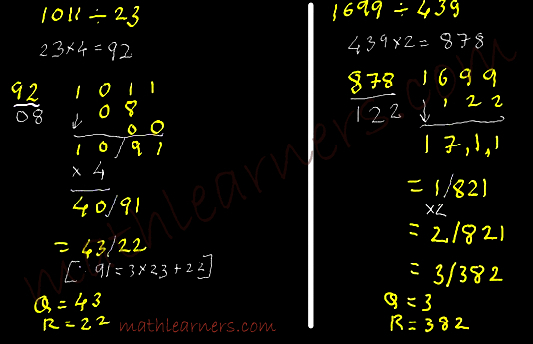 To avoid overheads its better to use multiplication. It might follow or followed by Vinculum for simplicity purpose. As seen earlier with bigger digits, calculation/process gets little bulky. So using Vinculum we need to convert bigger digits to smaller. As discussed earlier when we have larger divisor we apply Nikhilam and when we have smaller divisor we apply Paravartya. 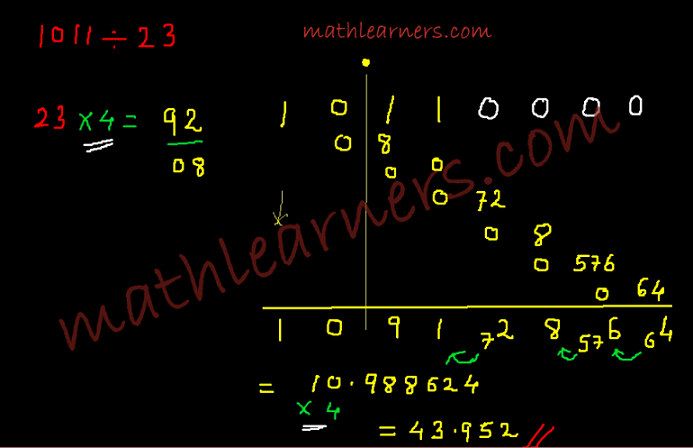 But when we have 1 or more larger digits (6,7,8,9) in divisor then calculating answer becomes little lengthy/time consuming also big multiplications are to be done. So we can convert such divisors in Vinculum Number. 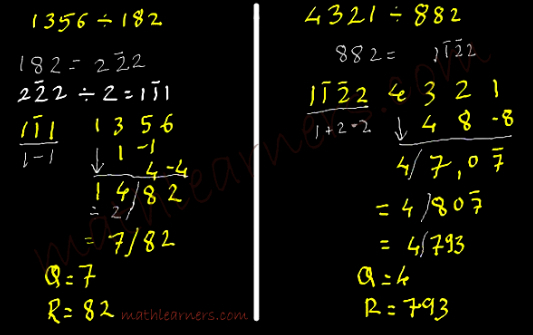 For already seen this example in Division’s Nikhilam method, 2621/828 requires multiplication with 7. 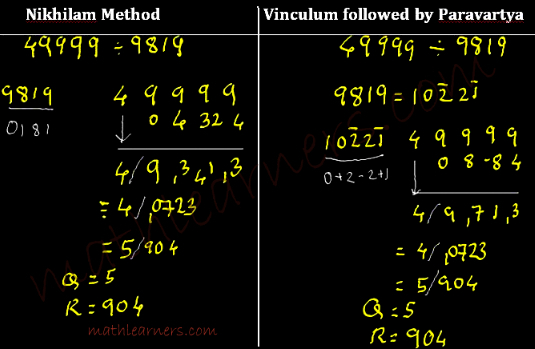 Using Vinculum we can convert bigger digits in smaller digits and then apply Paravartya Rule. According to the Divisor we apply Anurupyena or Vinculum or both followed by Nikhilam or Paravartya Method. Where you write, “As far as possible try using Multiplication instead of Division as in case of division (Anurupyena), as dependency will be present on factor (to avoid irrational number).” it is incorrect to use the term “irrational number” in this situation. You would certainly have to depend on being able to find a useful factor to avoid a non-integer number, but that can’t make an irrational. Right !!! My Bad…I restated to avoid confusion.